1. Grow larvae at 18°C in culturing media under uncrowded conditions (40-50 larvae in a standard test tube). At 18°C, their development is delayed up to 10 d; however, the chromosomes become thicker than at 25°C. 2. Wash two to three larvae briefly in saline solution. Transfer them to a fresh portion of the same saline solution and dissect out the salivary glands with watchmaker's forceps or sharp stiff needles. Carefully remove the fat body. This should take approx 1 min. 3. Transfer the glands immediately to a small glass cup with alcohol : acid (3 : 1, v/v) fixative. The volume of fixative should not be less than 1.0 mL; the cup must be carefully closed and kept on ice. Continue with dissecting the remaining larvae, changing the saline solution for each larva. Rinse your dissecting instruments in distilled water after each round of dissection. Collect the salivary glands in the fixative, but do not put more than 15 in 1 cup. Fix them for 15 min to several hours. 4. Transfer a couple of salivary glands to a drop of 45% acetic acid (about 10 |L) on a siliconized cover slip. Incubate for 30-60 s.
5. Cover the glands with a siliconized microscope slide; turn the slide over, and gently presquash the glands by tapping over the cover slip with a blunt needle or a pencil eraser. Slightly move the cover slip in a circular motion with a needle. 6. Cover the squash with filter paper and squash hard with your finger or thumb. Examine the quality of the squash (chromosome spreading) under phase contrast. If it is unsatisfactory, repeat the squashing once more, first adding a small drop(s) of 45% acetic acid to the edge of the cover slip. If the result is satisfactory, use a diamond pencil to mark on the back side of the slide the field containing the chromosomes. 7. Freeze the slide in liquid nitrogen and remove the cover slip with a razor blade. Immediately place the slide in 96% ethanol. 8. Change the 96% ethanol two to three times, incubating the slide for 10 min in each change. 9. Collect the slides in 2% uranyl acetate/ethanol solution for contrasting, keeping them in this solution for 12-24 h at room temperature or longer at 4°C (see Note 1). 10. Dehydrate the squashes in a series of alcohol-xylene: two changes in 96% ethanol; two changes in butanol; two changes in butanol : xylene (1 : 1); two changes in xylene, 10 min in each. 1. Prepare the Araldite mixture: Combine Araldite M and Araldite M Hardener (1 : 1, v/v), warm at 60°C, and mix using a glass rod; add 2% of Araldite M Accelerator and mix again carefully. Fill aluminum foil cups with this mixture (see Note 2). In the following text the mixture of three Araldite M Components will be designated as Araldite. 2. Saturate the squashes with epoxy resin. To do this, incubate the slides in xylene : Araldite (1 : 3, v/v) and then in xylene : Araldite (3 : 1, v/v) for 10 min each. 3. Remove excess Araldite from the slide using filter paper. Be careful not to touch the marked region of the slide. 4. Place the marked region of the slide with Araldite in the center of the foil cup. 5. Press the cup against the slide and remove excess Araldite by filter paper. 6. Put the slides on a plate and polymerize the epoxy at 60°C for 24 h.
7. Freeze the slide in liquid nitrogen, detach the Araldite block from the slide, and remove it from the foil cup. 8. Set the Araldite block into the hole of the plastic holder (see Note 2) and select a chromosome by using a phase-contrast microscope. 9. Draw the chromosome contour. This will be useful for further identification of the chromosome region under the EM. 10. Scratch out a square with maximum dimensions of 0.2 x 0.2 mm2 around selected chromosome using the objective marker (see Note 3). 11. Saw out the marked part of the block using a fret-saw (see Note 3). It is possible to get up to 10 small blocks from 1 initial embedding. 12. Trim a pyramid with a razor blade first roughly and then precisely with a new razor blade of high quality or with a glass knife using an Ultratome or Pyramitome. 1. Dip a carefully cleaned microscopic slide in 0.25% Formvar solution in chloroform. Slowly pull the slide out of the solution and dry it for 1-2 min. 2. Cut the film along the slide edges with a razor blade and dip the filmed slide slowly at an angle of about 5°-10° into a Petri dish filled with distilled water. Allow the film to float onto the water surface (see Note 4). 3. Place the EM grids on the film. 4. Lower another microscope slide onto the film with grids at an angle of about 60° and pull it from the Petri dish. 5. Remove excess water with filter paper and dry the grids. 6. Stabilize the Formvar film by carbon coating to a thickness of approx 30-50 nm. 7. Store the slides with grids in special box or in a covered Petri dish to keep them free of dust. 1. Insert a trimmed block in the ultratome holder and orientate the pyramid surface in parallel with the knife's edge. 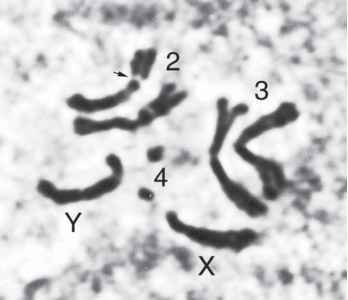 For identification of chromosome regions in the EM, it is very important to section a block without distortions. Remember also that the diameter of a Drosophila polytene chromosome is approx 3-5 |im and only the first 15-20 sections have chromosome material. 2. Cut thin sections with the ultramicrotome. If the first two to three sections are incomplete (i.e., less than one-third of the area of the pyramid square), reorientate the pyramid to get more complete sections. If the size of the first sections reach at least half the area of the pyramid square, continue sectioning. 3. Using curved forceps, pick up 10-15 serial sections on a Formvar-coated grid. The simplest way to do this is by touching the grid with suitable chromosome sections. 4. Remove water from the grid using filter paper. Collect the specimens in a grid box. 5. Analyze the grids and, if suitable, photograph in the EM at 60-80 kV.